Are you ready for Halloween? If you haven’t made your decision yet, here are a couple of things you can check out. Have you heard of the Rotary Clubs Huntington Haunt Experience at the Newland House? This runs Wed, Thurs, Fri & Sat night and is no ordinary haunted house, but an interactive experience where you literally become a part of the story, which can be best described as part haunted house, part theatre, and part interactive ‘moving’ play where the audience becomes involved in the twisted tale! And where else in Hauntington Beach would this chilling wedding take place than at the historic Newland House and Barn, spread among two ‘scare’ acres of haunted thrills and chills. Prior to the experience and awaiting your turn you can try to relax your bones at the Haunted Carnival with artisans displaying their wares, a Victorian physic, henna painting and a Costume Contest all while enjoying live entertainment, food, wine and craft beers. Tickets: huntingtonhaunt.org/purchase-tickets. On Friday and Saturday night from dusk til 10pm, there is the haunted maze at 9631 Sailfish Dr. Put on by the Horsky family – it is not for the faint of heart, in fact, they recommend adults only. Prepared to be scared as this house is transformed into a scary maze. Freights await around every corner from homemade yet professional looking animatronics to things of a more freakish nature, like Horsky's handmade skin quilt. On Halloween, bring the entire family down for the annual Halloween Fest. It runs from 3:30 to 7:30 on Main Street & The Strand. There will be an assortment of events for locals to engage in and join the lively entertainment including a kids costume contest at 4:30 and a canine costume contest at 6:00pm. There will also be free entertainment and rides, music, photo booth, petting zoo and more as well as special guest appearances, no tickets needed! If you don’t want to head to downtown, you can take the kids to Bella Terra for trick or treating from 6 to 8pm. Or if you are farther north, Sunset Beach is having their annual Halloween Party (on the 31st from 5 to 10pm) at the Sunset Beach Community Association, 16861 12th St. It is created for children and adults, the event will feature superhero-themed decorations, games, and activities. The event takes place from dusk to 10 pm. With a haunted house, animatronics, and actors in full costume, this event is FREE and open to the public! And finally, the following weekend the long awaited opening of Pacific City is here! You will get your first peek at the property on Saturday, November 7 from 11am-7pm and Sunday, November 8 from 11am-5pm. This will be the first weekend Pacific City is open to the public, so don’t miss your chance to be among the first to see the property and experience Pacific City’s first tenants’ opening preview! First guests to arrive will receive free tote bags with special merchant offers and giveaway samples. DJ’s will spin tunes, and complimentary “tastes” from participating Pacific City restaurants will be offered. Don’t miss the fun, freebies and festivities! Pacific City is located at 21022 Pacific Coast Highway in Huntington Beach. Enjoy and see you around HB. Did ya’ll survive the Open? Much calmer than in year’s past, huh… Now we see the summer quickly passing by. Where is the year going! So, are you looking for some stuff to do this weekend? Starting tonight through Sunday is the American Family Housing annual Ribs, Pigs & Watermelons Summer Festival at the Beach. All the scoop: www.rpwbbq.com. Do you have dogs? The new Paws Chateau (a Luxury pet resort offering resort-like amenities and recreational activities for dogs) is having their Grand Opening Celebration this Saturday from 10-2. There will be: SCVVC Low Cost Vaccine & Microchipping Clinic, Pawdicures, Pet Adoptions, HB Local pet market, Hot Dogs on the Grill, Ice Cold Beverages , Tasty Treats for Our Furry Friends and Their Humans. Plus a special presentation by the Huntington Beach Police K9 Unit @ 11:30. They are located at 7680 Talbert Ave.
Have you been to the new Certified Farmers Market at the Old World Village (7561 Center Ave). It is open now every Saturday from 9am - 2pm. Rain or Shine. They believe that it is important to provide ORGANIC locally grown produce, grass fed meats, milk home delivered, eggs, cheese, honey, olive oils, artisan breads and baked good, organic and health related products, and so much more to the community. All of the farmers are certified California farmers and their gourmet food vendors are local residents who prepare their hand crafted goods with only the freshest ingredients. They have also hand selected local arts and crafts vendors like hand made soaps and pottery or hand crafted jewelry; non-profits can attend each week to educate the community on different topics; local business owners have the opportunity to show their health and home related services or products. Please give them a visit - You will love this farmers market.www.OWFarmersmarket.com. Other stuff going on this weekend includes the Adventure Playground in Central Park, Beach Clean ups, HB Concert Band Summer Series (also in Central Park), and much more…..see them all on TheLocalHB.com calendar!! Hope everyone is enjoying your spring so far. Are you ready for Mother’s Day? How about starting it off a day early and treat your mom to an all you can eat pancake & sausage breakfast for only $5. On Saturday from 7am to 11am, the HB Host Lions Club will be cooking their annual Pancake Breakfast in Lake Park (12th & Lake St, downtown). There will be a Pancake Eating Contest, Pancake Relays, Pancake Art Demo & Contest and Photos with Miss Huntington Beach & Court. Also displays by City Parks & Rec, HB Police and Fire Departments and much more! Pop on over and enjoy this popular event! For a bit of education, next Wed, May 13 from 11:30am to 1:30pm our Chamber of Commerce will be offering another free business workshop hosted by Microsoft: “The Right Technology for Small Business”. This seminar will review the technology that will help you reduce your technology costs by 40%. They will review real life scenarios that plague most small business owners. Office 365 and its mobility features will be reviewed and demonstrated. They will also talk about what type of Internet and Voice connections are available and what VoIP actually is. Please join at the Chamber office and learn how to run an efficient business. (they even provide lunch). I’ve been to several of them so far and have learned something useful each time. RSVP your spot: 714-536-8888. Coming up the following weekend, May 15-17 is the annual Duck-a-Thon at the pier. This event always attracts a lot of people as everyone gets a kick out of watching hundreds of rubber duckies get dumped off the pier and “fight” their way to shore. The details for all three days of activities can be found on my calendar: http://thelocalhb.com/calendar.html. Not only do the Lions Club serve up pancakes, but on May 27 you can join them while the Waterfront Hilton serves them up (and guests) wine at their Wine Tasting fundraiser to support local community charities. It is 6-8pm and for $25 you will sample wines from the Shade’s California Collection. Hors d’oeuvres will be available along with a fine selection of small bites that can be purchased at nominal prices. There will be opportunity drawings and valet parking will only be $3 for the event. You can pay at the door, but please rsvp your attendance to 714-328-8661 or hblionsclub@gmail.com. The Hilton always does such a nice job at these wine tastings. You don’t want to miss this chance to have a fun evening and support charity while doing so! And finally for this pass, we are pleased to report our vip tickets for Wags-n-Wine sold out in less than two weeks once it was announced ticket sales were open! We only have a couple vendor spaces left as well. I know once again this event is going to be awesome. Come on, where can you go to enjoy top notch food and wine/beer AND have your four legged companion with you!! June 14 is the date you want to mark on your calendar. The general admission is a great deal, so don’t fret. Go to the website, www.wagsnwine.com and check out the vendors who have signed up so far and photos from past events. And here is wishing you all a happy May. The public is invited to an afternoon reception at the HB Public Library (7111 Talbert Ave) on Tuesday, January 27 from 2:30 PM to 5 PM – featuring 19 authors and illustrators of children's books. These authors and illustrators will have spent the day at local schools, sharing your love of reading, writing and the creative writing experience with our students. You can meet and greet these authors and illustrators at the Library, and they can sign and personalize books for all the special children in your life. Books are the perfect gift for children – no need to worry about size or color, no assembly required and batteries not needed! AND these personalized books will be treasured by students long after other toys break or are given away. Barnes & Noble will be at the library reception to sell the authors' books. That afternoon, the Friends of the Children's Library and the Sand Scribes Children's Writing Group will host awards ceremonies for 42 local students who are winners of our Writing and Illustrating Contest "Spin Us a Story" and their winning entries will be on display in the library lobby through the month of February. We hope to see you at the library Tuesday afternoon! Here we are well in to the first of 2015. I hope everyone had a great holiday season and is ready for a prosperous year. I know I started the year off with a bang and business is booming. I'm not one for the term New Years resolutions, as a friend of mine claims, you are setting yourself up for failure when you make standard resolutions just because it is the first of the year. Proper goals, however, are another story. Since fitness and getting in shape or losing weight continue to be on the top of most people'slist, a local trainer here in town has a challenge for you. 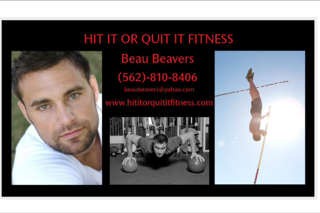 Beau Beavers of Hit It or Quit It Fitness wants to help. Beau, a former college decathlete has dedicated his life to fitness. He knows most people sign up for a gym at the first of the year and last about a month failing for various reasons. Now that we are ending that first month, if you want to reach the success you set out to achieve, check out what Beau is offering locals - download his bio and offer HERE. Another popular goal for folks is to make improvements in their business. Often folks don't know how to go about doing this. May I suggest checking out Vaughn Sigmon with The Alternative Board. He has over 35 years experience successfully leading, growing, and managing businesses. Talk to him and see if he can help you and your business: 714-421-6498 or vcsigmon@tabhuntingtonbeach.com. Enough of business, how about some fun!! Fuzion is hosting a customer appreciation day this Saturday, the 24th, all day. Swing by (7227 Edinger) any time from opening to closing and everyone will receive a free $10 game card good for all the arcade games and LaZer tag. Plus 25% off all their food (not already discounted). Check them out at www.fuzionhb.com. Those are just a few events coming up so you can mark your calendar for these not to miss events.